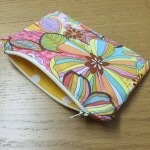 This zipped purse is a great little project that always delights the maker. It is a perfect introduction to using a zipper foot to insert a centred zip & also demonstrates how to include a lining for a neat & professional finish (with no need to finish off any of the seams! ).